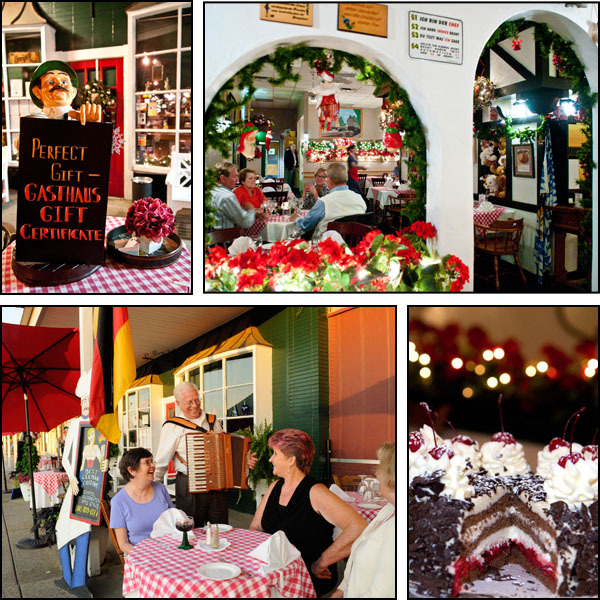 Hasenpfeffer « GASTHAUS: got 'kraut? 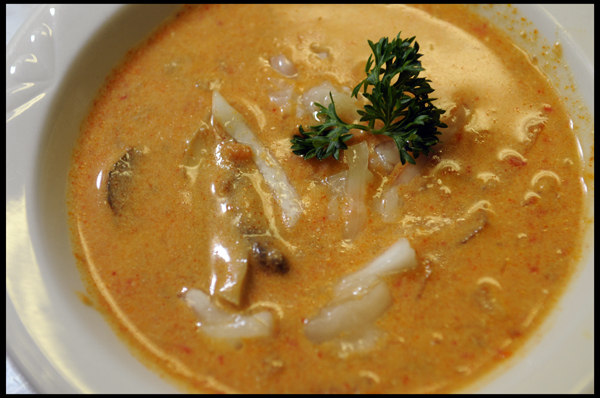 Note: due to popular demand we will continue with the Lentil Soup and change to the Witches’ Brew (Hexensuppe) after that. Lentil Soup with Tender Pieces of Beef, Smoked Sausage, Carrots and Potatoes. 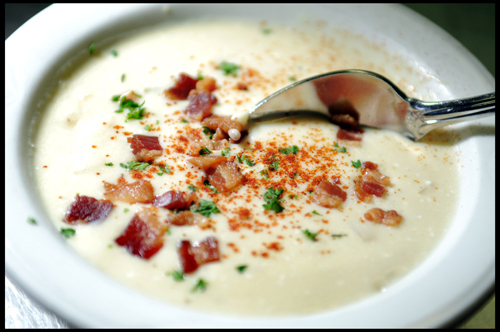 A Traditional German Fall Dish. 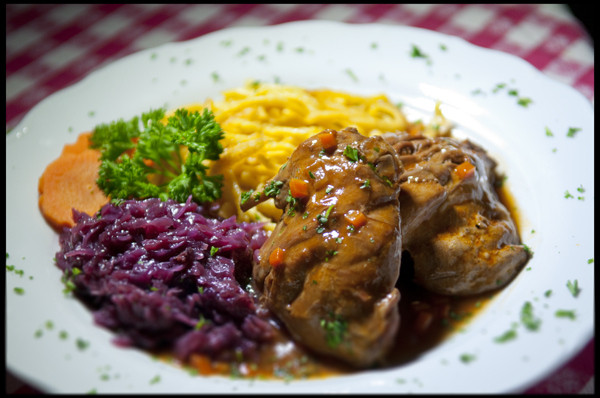 Tender Pieces of Locally Farm-Raised and Slowly Pot-Roasted Rabbit, served with Spätzle and Red Cabbage. 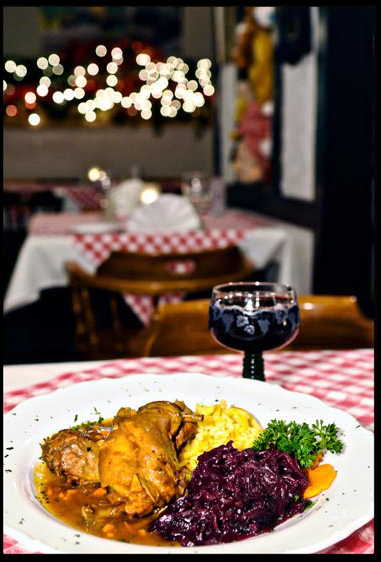 Hasenpfeffer, a traditional German fall dish, will be our special starting October 25!! 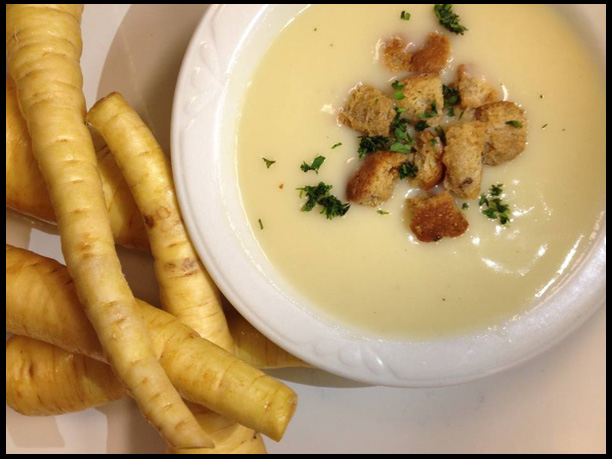 New specials next week, but Hasenpfeffer has been extended!!! By popular demand, we have extended serving Hasenpfeffer until November 14. The Nürnberg sausages are our next special. A traditional German fall dish. Tender pieces of marinated and slowly pot-roasted rabbit, served with spätzle. and red cabbage. 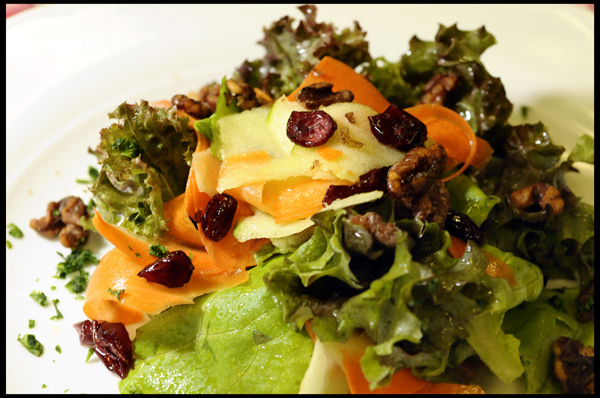 Mixed salad greens, shaved granny smith apples, dried cranberries, carrots and caramelized walnuts tossed in a champagne vinaigrette. 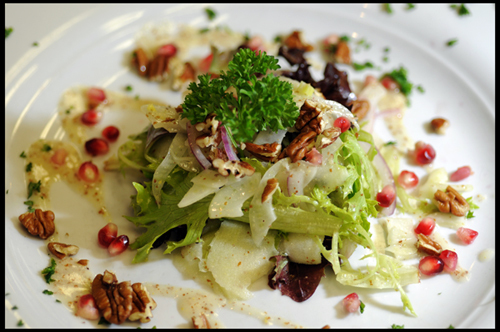 Mixed Salad Greens, Fennel, Red Onions, Granny Smith Apples and Pomegranate Seeds tossed in a Whole Grain Mustard Vinaigrette topped with Pecans. 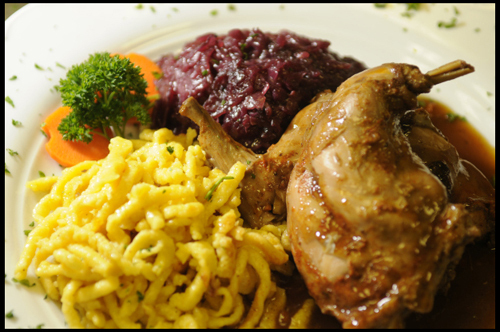 Tender pieces of marinated and slowly Pot-Roasted Farm Raised Rabbit (bone in) served with Red Cabbage and Spätzle. Hasenpfeffer is back on Oct 28 for two weeks! Mark your calendar and make your reservations early, because our popular dish Hasenpfeffer is back starting Tuesday, October 28 until Saturday, November 8. 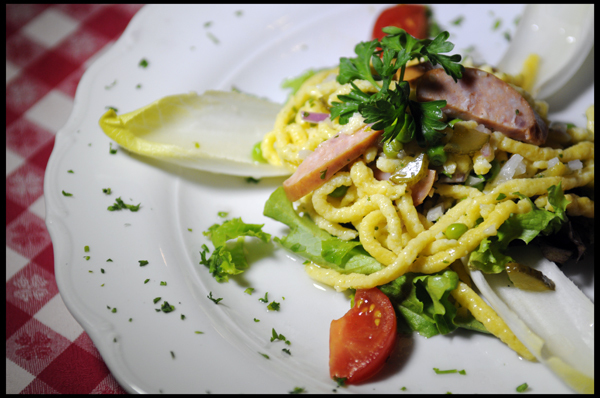 Spätzle tossed with Green Peas, Pickles, Red Onions and Smoked Bavarian Sausage in a Home-Made Riesling Dressing garnished with Salad Greens and Tomatoes. A Traditional German Fall Dish. Tender Pieces of Marinated and Slowly Pot-Roasted Rabbit, served with Spatzle and Red Cabbage.